It’s not your imagination that all of Manhattan is starting to smell like the bread being baked for Subway’s $6 footlongs. The world’s biggest chain is ubiquitous enough in the borough that there is, on average, an outpost every 4.8 blocks. Programmer Aleksey Bilogur, the CUNY student to thank for this reminder about the unavoidability of the borough’s corporate chains, says the average distance between locations is a mere 1,154 feet, yet because it’s an average, those Italian BMTs and Cold Cut Combos are likely much closer in areas where lots of residents work and live (so, probability-wise, wherever you are). The math is a little more complicated than the total number of locations divided by Manhattan’s size. Bilogur actually took the big names in the State of the Chain’s annual list and did some fancy data-mining to calculate the average distance per foot and street between a person dropped randomly into Manhattan and the depressingly prolific chain in question. 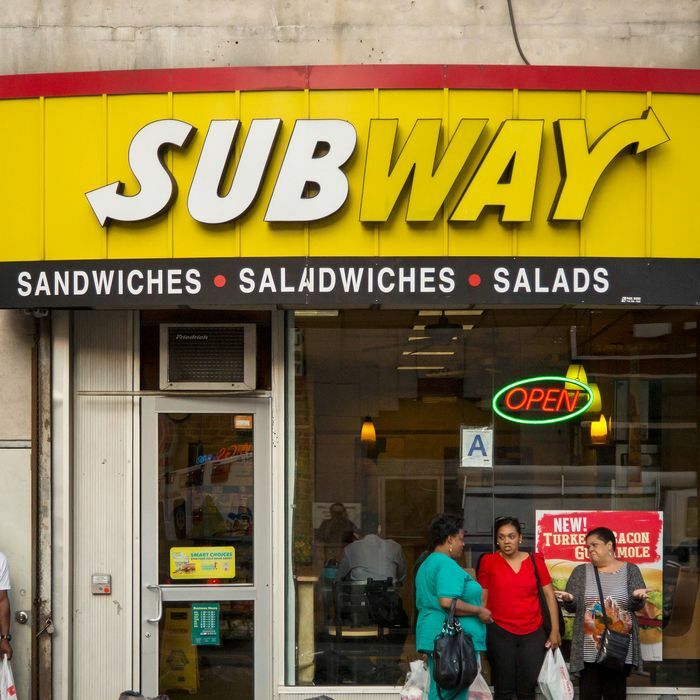 It turns out Subway is the hardest one to escape, but, to no surprise of anyone who’s walked any strip of midtown or the Financial District, it’s only by a hair: There’s a Dunkin’ Donuts every 5.3 streets, a Starbucks every 5.6 streets, and a McDonald’s every 6.4 streets. Taco Bells occur every 19.2 streets, while people trying to keep their distance from Pizza Hut have, on average, a pretty vast 27.3-street area to mosey around in.